1. Soak the bean overnight and pressure cook for 3 whistles by adding salt and crushed ginger and garlic to it. 2. Then heat oil in the frying pan season with cummin seeds. 3. Add onion saute till light brown add tomato and fry until they are well mashed. 4. Now add the cooked bean, chilli powder, salt and garam masala. 5. Let them simmer until all the moisture is absorbed , at the end add the lemon and garnish with coriander leaves. 6. This can be served with roti too. 1. Apply the green chutney to one bread and tomato sauce to another bread. 2. In the middle of both breads keep the bean mixture and raw onions. 4. The above method is for closed sandwich. 5. 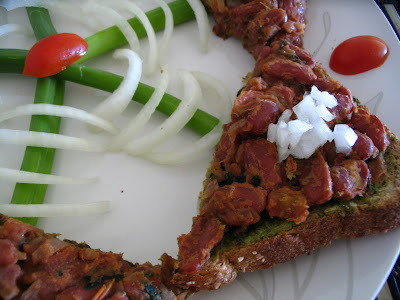 For open sandwich apply the chutney and keep the bean mixture and broil in the oven until bread is crispy then top it with raw onion and serve. Healthy and yummy sandwich! 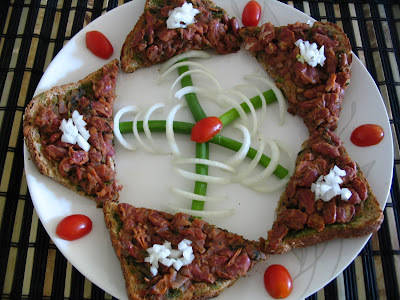 Great idea to make sandwich with Rajma..also nice presentation n shots! i must congratulate u for this fantastic presentation. very nice dish! OMG how much time do u take for the arrangement....i will go crazy if u don't answer ...lol!!! 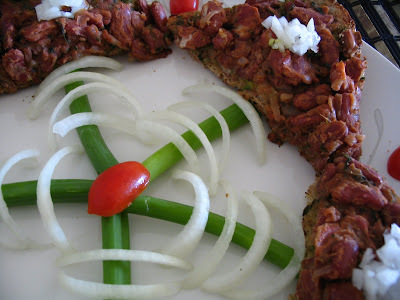 Using Beans for the sandwich is also a very nice idea..loved the idea of onion spirals. Thanks gals for your encouraging comments happy that u all loved the presentation. wow! great pesentataion ...Thanks for sharing ur recipes dear ...will surely come and see all ur recipes especially the way u pesented is fantaboulous ...great !